RS21 charter sailors got their first taste of the boat at Charleston Race Week during the official practice day on Thursday. The wind ranged from 11 to 17 knots in the afternoon on Circle 4, giving the fleet a chance to test out the boat in the notoriously tough Charleston conditions. For many, Thursday was the first time hopping in the RS21, though several sailors test sailed the boat during various demonstration events across the country. 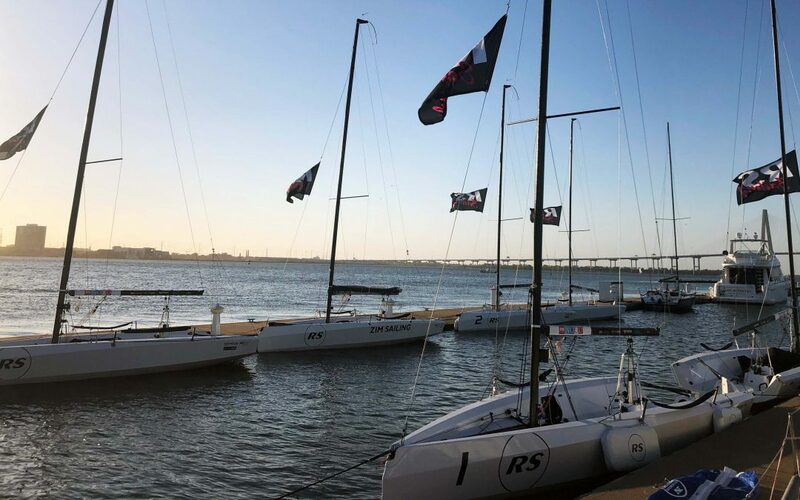 In total, 8 RS21s will compete over the weekend, giving the class its second major event in the U.S., following the first one design event during the San Diego NOOD regatta March 15-17. In puffy conditions with strong current, teams were focused on learning the lay of the land in the boats during practice. “It was great, fantastic. We’ve never sailed together, so we’re getting to know each other as well as the boat,” Mark McNamara, of Lakewood Yacht Club in Seabrook, Texas, said. For McNamara’s team, which saw top speed of 11 knots during practice on Thursday, a chunk of the day was spent tuning the rig. “We spent a lot of the day with the rig,” said Seth Rosenthal, with Zim Sailing. “Because it’s all new, everything was stretching with the rig, so we would crank on, crank on, crank on more of everything.” Charter teams were also looking forward to working on boat speed heading into the first race day after learning how to position sails, crew weight, and continue tweaking boat controls. Racers were supported by local Charleston racer, Scott Herman, who kept the fleet supplied with beverages and provided feedback on the water. Racing begins Friday morning, with a warning signal at 11:00 a.m. Many thanks to RaceGeek, Spinlock and Sail22 for their support. To keep up to date over the weekend follow RS Sailing and RS21 on Facebook to see all the action first!